This once a month topical cream will keep your scrappy little friend in good shape without the ugly necessity of force feeding him/her an unpalatable tablet. So if your dog is 8.8 lbs. or less, scientifically safeguard its quality of life as soon as possible using the patented Advantage Multi 6 Pack Small Dog formula. All products are well within expiry dates. Generally the items are manufactured about six months ago with a three year lifetime, so on average you have about 2 years before the expiry date is reached. 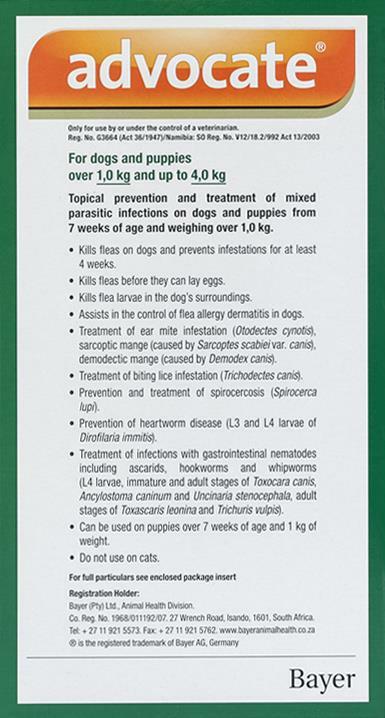 2 - 4 treatments with Advocate, given monthly would be effecting way in treating Demodectic Mange. Yes this product is for dogs and puppies (older than 7 weeks of age) under 8.8lbs. Can this product be used on puppies? We recommend using http://www.petbucket.com/p/8788370/revolution-puppy.html for puppies. Great product. The product was mailed in safely. Will continue shopping here as long as shipping is free!